New Construction being done at the fields with 2 New Turf Fields going in & a New Building being put up. The league expands to 2 more teams Panthers & Bears with 650 players. The league now has 12 teams in both Little & Middle age groups. There are now 10 teams in the Big age group. The league expands to 2 more teams, the Eagles & the Chargers with 580 players signed up this year. The league now has 10 teams in both the Little & Middle age group. There are 8 teams in the Big age group. The League has a total of 8 teams in the Little, Middle & Big age group. The Teams are Raiders, Knights, Devils, Hornets, Wolves, Vikings, Hawks, Tigers. The League expands 2 more teams, Hawks & Tigers for a total of 8 teams in both the Little & Middle age group. Ron Goodman gets our New Field & Practice Lights Donated. Ron Goodman Joins the league. The league suffers another loss, Ted “The Old Man” Byrd passes away. He is greatly missed. Ed Wilbourn joins the league. Ted Byrd & Scott Shahbaz signed a personal note for $52,000.00 to buy new equipment for the league. The current teams are now the Raiders, Knights, Devils & Green Hornets. The league has grown to a point to where it moves to it’s present format of 3 age groups Little 7,8&9 playing 8 man football, Middle10 &11 and Big Division 12,13,& 14 with all the teams playing a full game. The teams at the present were Rebles, Knights, Hornets, Devils. The league looses a good friend John “Mack” Mecklenburg passes away. Scott Shahbaz rejoins the league to coach the Hornets after coming back from the Military and being a former player. Scott Shahbaz starts coaching with the Eagles. The league moves to its current location from where Little League Baseball is at the present. The league expands to 2 more teams the Blazers & the Chargers. 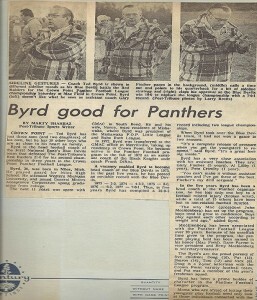 Ted Byrd joins the Panthers and there is now 185 players with 6 teams. With the Little teams playing only 1 quarter. The current teams are the Knights, Raiders, Rebels, Eagles, Hornets and Devils. League grows to 160 players. Panthers now have 150 players and 6 teams Knights, Raiders, Rebels, Eagles, Hornets and Devils. Purchase lights for the field and the International Brotherhood of Electrical Workers ( I.B.E.W ) will donated time to install them. Games were played at the Crown Point Little League field just south of the Major Field. Panthers leaves Pop Warner to form there own League. They now have 4 teams Knights, Raiders, Rebels and Eagles. League is incorporated in Indiana as a Non-Profit and as a Tax- Exempt Corporation. President Lesie Gumbiner with 60 players and 2 teams the Panther Varsity and Cubs. John Mecklenburg is elected President, Secretary. Betty Mecklenburg Vice President , Treasurer. John Mecklenburg joins the League. Panthers were founded by James Clarke, Lesie Gumbiner and Jack Bixeman with 35 players and one team. The first coaches were Jack Bixeman, Vince Loosemore and Herman Knesek. Games were played at the Crown Point Little League field just south of the Major Field.